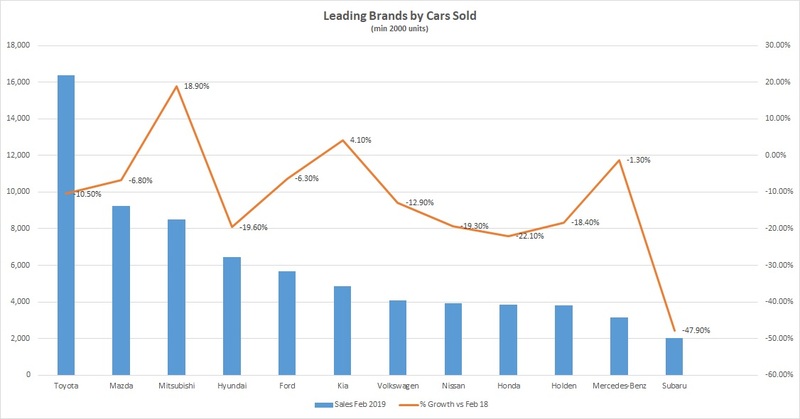 In our first piece covering February’s new car sales, we looked into overall sales across the industry as well as a breakdown by vehicle segment. This time around we’ll focus on how different makes and models fared last month. Although it was no surprise to see Toyota well out in front for the number of cars sold last month, the Japanese manufacturer did record a prominent slump in sales, something that hasn’t always happened when overall sales were down. Nevertheless, with over 16,000 cars sold during February, the brand still represents 18.8% of national sales for all cars. While there were several auto-makers at the lower end of the scale which posted big jumps in sales, among those with a reliable base of at least 2000 sales, Mitsubishi and Kia were the only winners. Both manufacturers had a solid month in January as well, illustrating their price positioning and extended range of vehicles may be appealing to price conscious buyers in the current market climate. At the other end of the scale, Subaru’s sales dropped by almost half, coming off a high base in February 2018, while Holden’s woes show little sign of abating, its sales down 22.1%. The top 10 vehicles sold throughout February were almost a mirror image of that the month prior, with only one change as far as the list of inclusions. The Holden Colorado dropped out of the list, replaced by the Toyota LandCruiser 70/200. With light commercial vehicles gaining 6% during the month, it resulted in three utes taking out the gold, silver and bronze positions. It won’t come as any shock to see the Toyota HiLux and Ford Ranger at the top, despite the Mazda 3 topping the latter in January. But it was the Mitsubishi Triton that emerged as a surprise packet. With sales growing 66.6% we’re witnessing the true popularity of the model emerge now that it has cemented itself as a favourite among tradies. Sales for the Mitsubishi ASX also leapt significantly higher on account of timing matters and a surge in the popularity of SUVs. As alluded to earlier, the price positioning of the ASX is certainly helping it gain market share. Meanwhile, the number of Toyota Corollas sold declined 36.7%, which could be attributed to a higher price-point for the new version, and the growing trend of families favouring larger vehicles. One of our accredited dealers will be in touch shortly to discuss specific exclusive discounts available on this car. At no cost, nor obligation.